• Solstic Energy—helps reduce fatigue, supports mental performance, boosts metabolism. •Solstic Revive—replaces electrolytes; provides glucosamine for joint support plus amino acids for muscles. 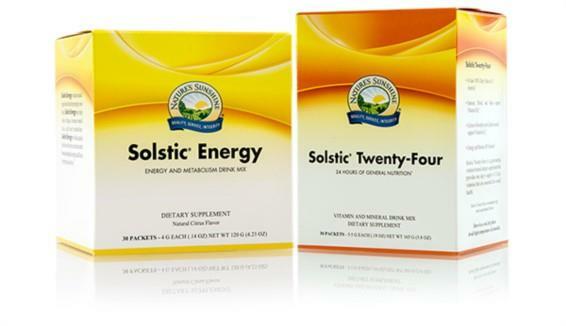 • Solstic Twenty-Four—supplements your diet with minerals and 13 vitamins. • Relief Formula—helps relieve minor aches and pains from exercise and physical activity. •Joint Support—provides herbs traditionally used to support joint health and the structural system. • EverFlex with Hyaluronic Acid—supports joint lubrication, flexibility and mobility. • EverFlex® Pain Cream—with MSM and menthol for temporary relief of minor aches and pains in muscles and joints. • Recover Soothing Blend—Cool and soothe muscles with wintergreen, peppermint, camphor and other essential oils. • All orders must be received by 9 p.m. EDT on April 13, 2018. • Special offer(s) not valid on prior purchases or purchases made after April 16.